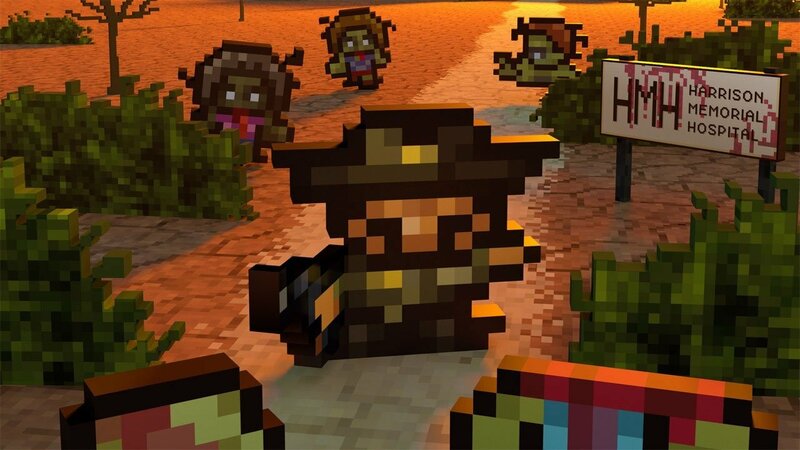 The Escapists: The Walking Dead is a difficult game to review. It’s everything it says on the box; I just wish it were a bit more Walking Dead and a bit less The Escapists. It’s a beautiful and charming game, it features great music, the fan service is spot-on, and by all accounts, it should be great, but my lasting impression is that this lovingly-crafted game still feels a bit too much like The Escapists was re-skinned in The Walking Dead universe. For some, that may not be such a bad thing, and indeed, it’s still a fun little game, but for this reviewer, it doesn’t do enough to set itself apart from its predecessor. Of all the games that borrow from The Walking Dead, The Escapists: TWD follows the events of the books and television show the closest. Though it only features five levels, you’ll play as Rick as you’ll wake up in the tutorial level at the Harrison Memorial Hospital before having to keep your band of survivors alive through the Green Family Farm, the Meriwether Correctional Facility, Woodbury, and finally an overrun Alexandria. The issue I take is that these areas feel like only slightly less confined prisons (except for the actual prison) when compared to The Escapists, given the game uses the same formulaic time management system. It worked very well the first time around, but in The Walking Dead universe, it feels a bit tired. It works great when you’re trying to break out of prison, where all you have is time, but here it just feels like you’re trying to break out of the farm, or… the prison… I guess. 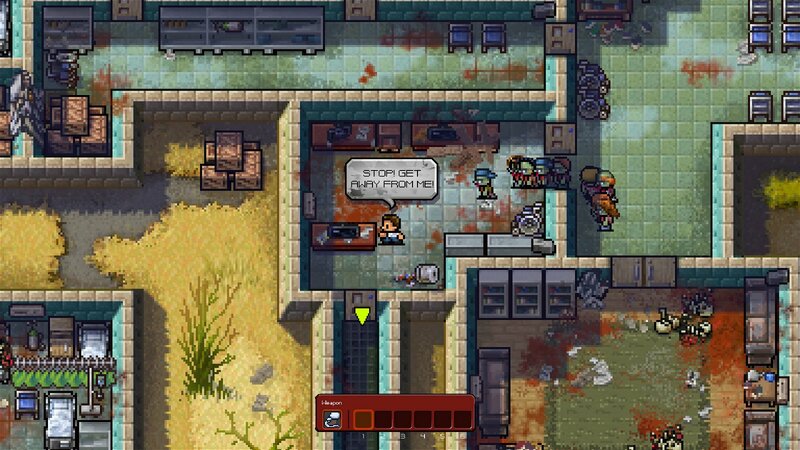 That being said, there is definitely a lot to like about The Escapists: The Walking Dead. The crafting system is back and lends itself perfectly to the TWD setting, and the game manages to skip most of the soap-opera-ish crap between Rick and Lori without feeling like it’s missing anything—not that there’s a huge focus on dialogue and story here, most of it being told through a series of animated cutscenes. Little snippets of dialogue from the books and series have worked their way into the game in the over-the-head dialogue, which is a great little touch. As is the fact that it’s not narrative-driven, so the disjointed nature of various characters and their mismatched timing for dialogue makes them appear more caricature-like than anything. I quite like it, if I’m honest. One thing that players might not appreciate so much, though—particularly if they’re not followers of the source material—is the jarring nature of the transitions from one level to the next. With five major settings, the first being but a brief tutorial level, the fact that the game spans the entirety of the major locations in TWD means that there’s little in the way of connecting story to properly segue newcomers from one block of the story to the next. It’s clear then that this game is made for existing fans of the TWD franchise, but non-followers who are coming to this from their love of The Escapists may be disappointed with how much of the TWD story is glossed-over. Still, I’m nitpicking. I don’t mean to sound like I didn’t enjoy my time with The Escapists: The Walking Dead. Quite the contrary. While I may have moved on from my love of formulaic gameplay, there is something distinctly likable about the tedium of seeing an objective right in front of you but knowing it will take plenty of work to reach it, and bashing zo… walkers with soap in a pillowcase always makes me giggle. The minigames for levelling up strength and endurance, if recycled, do offer something to help break up the monotony of your daily tasks, and the random quest system that has you perform favours for other survivors in exchange for currency that can be traded to a late-night purveyor of weapons is a nice touch. Sadly, my real lasting memory isn’t of the beautifully crafted pixel graphics, or passionate translation of the source material (wonderful though they may be), but instead, of a cursor-scrolling bug related to specific Razer hardware. It seems to primarily affect the Orbweaver and hardware using the Switchblade UI like my keyboard, and disconnecting the offending hardware is the only current solution. If I didn’t make such a point of keeping a 360 controller handy, I’d have been well and truly stuffed. It may only affect a tiny percentage of players, but it’s something to be aware of, for sure. Absurdly uncommon bugs aside, The Escapists: The Walking Dead is a very fun little game. While I hesitate to say the $20CAD price tag is worth it for everyone, fans of TWD will certainly find plenty to appreciate in the game’s renditions of key locales. And while I think I’ve drunk my fill of time management for a while, fans of The Escapist will find plenty more to enjoy in this new (mostly) non-prison setting. It may not be everything I was hoping for, but it also didn’t disappoint. 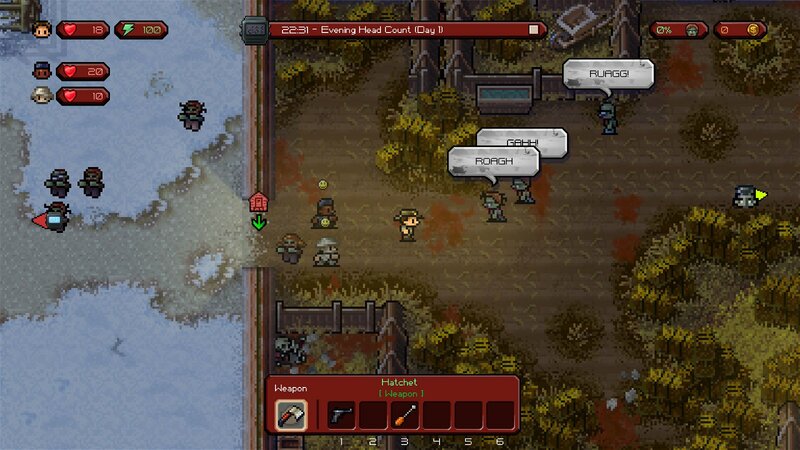 Absurdly uncommon bugs aside, The Escapists: The Walking Dead is a very fun little game.